When you have a house full of children like we do, going out for dinner as a couple doesn’t happen very often. When we do get the chance to go out together, we prefer not to do it on a busy night like Valentine’s Day. 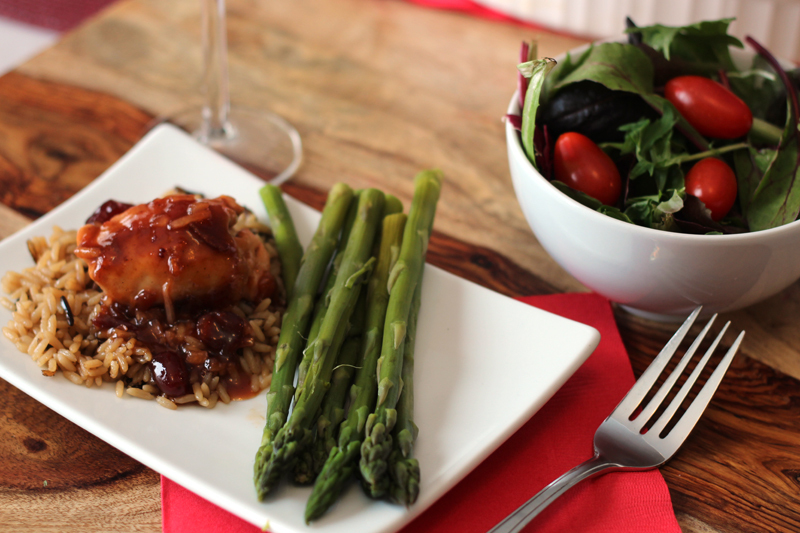 Our Valentine’s Day includes a home cooked dinner for the entire family. My husband and I are making healthier choices and I want to make sure we don’t lose momentum because of Valentine’s Day, so I want to avoid red meat or high calorie meals. Chicken seems like the perfect choice, and this Orange-Cranberry Chicken doesn’t just look right for the holiday, it is also very easy to make and is sure to be a hit! Arrange the chicken in a casserole dish. Mix the remaining ingredients in a pot and heat over high heat until boiling. Turn down to low and heat for 5-10 minutes to thicken. Pour enough sauce over the chicken to cover all, and continue to heat the remaining sauce on low. 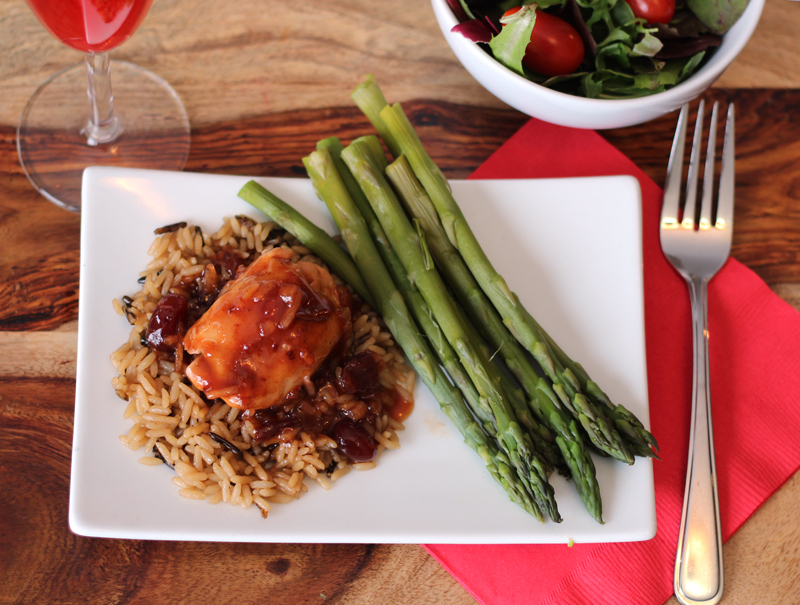 Pair the orange-cranberry chicken with some wild rice and asparagus and you have a healthy and delicious dinner that is perfect for your Valentine! I might just give this a try, I am intrigued by the ingredients. Looks delicious.. And I think I have the ingredients. Thanks for the recipe. I love recipes like this one – fairly simple to make and yet packed with flavour! Thanks for sharing. This sounds absolutely delicious. I’m sending this one to my mom. Sounds yummy, too bad I can’t eat cranberries 🙁 But I will share the recipe with my sister, I think she would really like it! I bet my hubby would like this. I like casserole cooking it gives me time to relax and clean up. The sauce is savory and colourful too it presents well. This sounds like it has a nice balance of flavors. I was just sitting here wondering what I was going to make for supper tomorrow, well I now know what I’m making, went and checked and I’ve got everything..Yes!! this is going to be one great supper!! This looks delicious and it’s a nice dish. that looks very tasty, I love your recipes. we enjoy chicken and big fans of wild rice. sounds aweome to me; will have to try this recipe. thanks. This recipe for Orange Cranberry Chicken is one, I believe, that should be served at any time one wants a healthy and delicious meal. I love the taste of chicken with cranberry and, like you, we are trying to eat healthier meals. Thank you so much for this recipe. Orange and cranberry are a match made in heaven!